Admiral Nelson is to have his broken arm X-rayed as part of a £420,000 restoration of the famous Trafalgar Square statue. Modern radar equipment will be used to see the damage caused to his left arm when lightning struck in the 1880s. 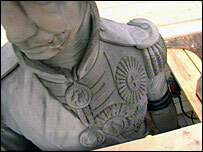 Bronze straps were fitted to the arm after it was hit but now restorers want to complete a more sympathetic repair. The first major restoration of the grade I listed Nelson's Column since 1986, is due to be finished in July. Experts will also install "pigeon proofing" measures and remove droppings. The 185ft high column was completed in 1843 to commemorate Admiral Horatio Nelson, who died at the Battle of Trafalgar in 1805. It has been cleaned several times but the whole monument has only undergone restoration twice, in 1968 and in 1986.